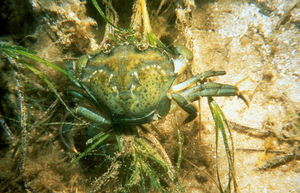 Carcinus maenas was first reported from Port Phillip Bay in 1900 but is thought to have been introduced to Australia in the 1850s. It is now found in Tasmania, Victoria and New South Wales. It is thought to have been introduced in semi-dry ballast from ships, and its current distribution is more likely due to coastal shipping. Natural dispersal by larvae is also likely to have contributed to its current distribution in southern Australian waters. Ballast water, fouling in sea chests of coastal vessels, and accidental inclusion in oyster trays transported between areas for grow-out are all likely dispersal mechanisms for Carcinus.